A constant through all Clinton campaigns seems to be dirty tricks and intended to control the narrative: leaking salacious claims about the opposition to distract from all the negatives on their side of the aisle (then lying about it, repeatedly when caught). It didn't have to be true, it just had to keep people talking and questioning things until after the election. Just like the Clinton Administration's involvement in sensationalizing the Obama is from Kenya or a Muslim and being the impetus behind the Birth of Birthers movement. In this case, the Clinton campaign was trying to do the same with the idea that Russians had gained compromising information about Trump (also known as "kompromat,") and had been "cultivating, supporting and assisting" him for an elongated period of time. They wanted the public to believe that Trump was the Manchurian candidate. The most salacious claims are that President Donald Trump (a known germaphobe) paid Russian prostitutes to pee on the Ritz Hotel bed in Moscow that Barack and Michelle Obama slept on when they visited. 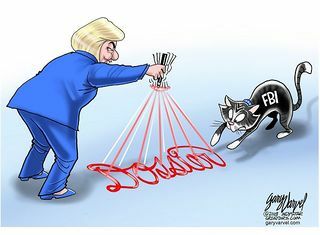 And of course, that it was all captured on video, and the Russians could use that to control Trump through blackmail. There's some evidence that a few non-material things might have happened, but there's far more that is provably false... not to mention many names spelled wrong, date and factual errors, and whole concepts that have been investigated deeply since then and no evidence found... but mere errors and lies are not going to stop the people that truly want to believe. Distract, obfuscate, and change the topic. There's some nuances in the funding that the Democrat media uses to try to cloud up the issue, and the media got it wrong (FakeNews) by repeating the DNC talking points and claiming Republicans funded the Dossier. 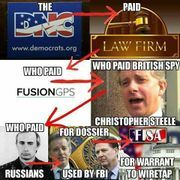 Also after Hillary had gloriously lost the election, her campaign and the DNC stopped funding the dossier (which had been almost completely compiled by this time), so the co-founder of Fusion GPS (Glenn R. Simpson) paid for last couple weeks of work, and then handed the dossier to British and American intelligence services to use to undermine the President and the election. While agents openly mocked the shoddy report, the FBI/Obama administration still used it to get FISA warrants to spy on the Trump campaign during an election, and the FBI got caught omitting the origins of the report to the judge. Misleading a judge is a federal crime and is being investigated as such. To date, no one has gone after Glenn R. Simpson for his culpability in this smear campaign, nor will the media blame the DNC or Hillary campaign for their part in trying to undermine the office of the President. According to Comey, Trump "told [Comey] to consider having the FBI investigate the prostitutes allegation to 'prove it was a lie'". It seems highly unlikely that the President would request the director of the FBI to investigate something to exonerate him, if he was guilty and there might be evidence the FBI could uncover. Think about the bigger picture, here's a President that got caught saying/doing all sort of foul things, and he just waved them off. The man tweets from the oval office like a Tourette's victim screaming obscenities in a library, and they think he's worried about what the Russians might say he did? Trump bragged he could shoot someone, and not lose votes. Trump doing a few hookers in a Hotel, and paying them to pee on Obama's bed, is only going to help Trump with his base. So not only didn't anything in the Dossier seem troublesome, let alone worthy of compromising him, but it seems to miss the basics of who Trump is. That Dossier could only appeal to biased Democrats who refuse to think this through at all, and wouldn't vote for him if he cured world hunger, ended disease and caused world peace in the same weekend. This page was last edited on 22 April 2019, at 14:49.